A Buddha image or a statue never fails to stop me in my tracks , captivate me and transport me to at least a few minutes of private contemplation even in a public place. Those few minutes are meditative , powerful enough to permeate my being with small bouts of serenity. 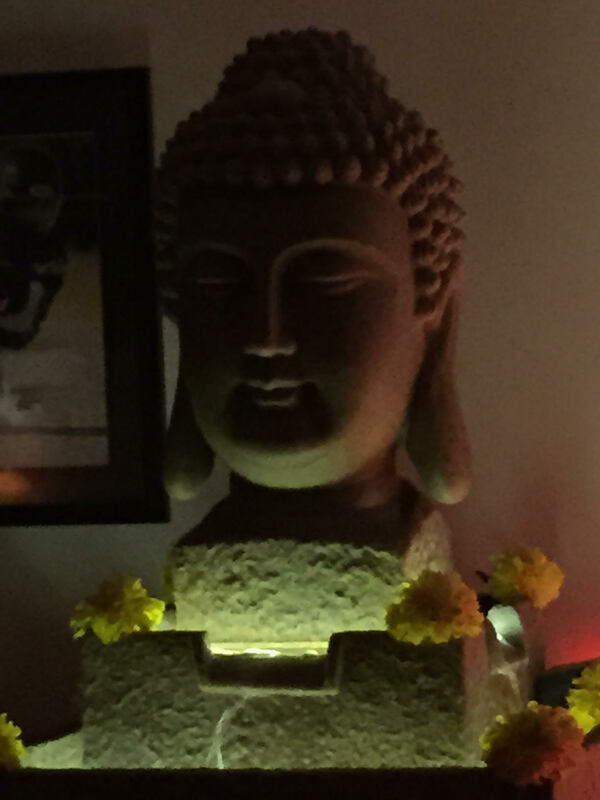 I was at a friend’s place for a party last night and was drawn to this figure of the Buddha in her living room even amidst boisterous conversations and a lot of gaiety. The lighting helped , or rather the meagre lighting helped , making it all at once dramatic and striking. 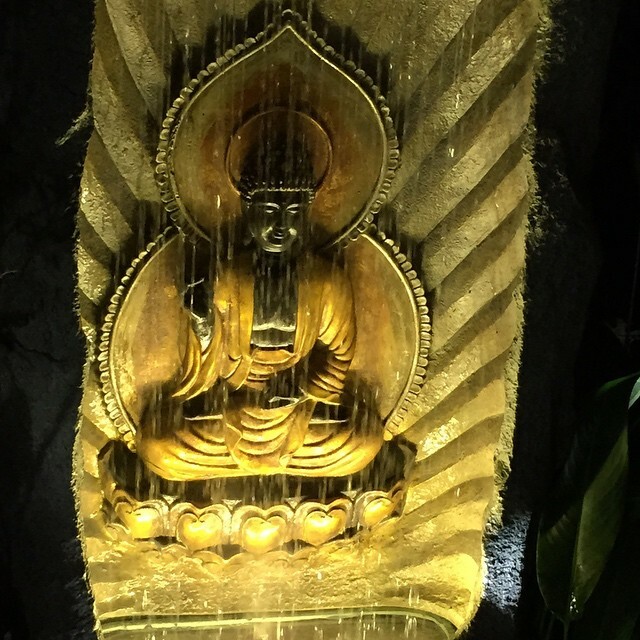 I stood there transfixed for sometime , completely oblivious to the chatter of the party , my mind captured by the beauty of the Buddha , the subtle light of the lamps lending lambency and the almost silent trickle of water in the base that glistened and twinkled. The yellow marigolds only seemed to add a sense of worship to that corner of the room. I had to capture the visual beauty. Those few minutes were meditative. So enraptured by this visual , I am certain to see this image in my mind’s eye every time I think of Buddha. I was drawn to the yellow marigolds equally , backlit beautifully. I wondered if the flowers had been placed there for worship or for the purpose of decoration , could be both ! The hostess of the house is spiritually inclined and is a Bharatanatyam dancer along with being into wedding planning. That speaks for the aesthetics ! Lotus and marigold are two flowers primarily used to worship Buddha and decorate the place of his worship. Marigolds symbolise auspiciousness in Hinduism. Yellow and orange also signify renunciation and are ‘the colours’ used during our rituals in various ways to signify surrender to the higher being. May I take you back to my earlier post Orange Glory the Colour of India in response to the Daily Post photo challenge to bring home the point ? More interesting would be what is often quoted as a significant reason to using marigold during worship in Hinduism. The flower has a stout , erect stalk , which sometimes makes it hard to pluck it from the plant. In fact , the Sanskrit name for marigold is ‘Sthulapushpa’ , which signifies exactly that. It symbolizes trust and faith in the Divine and imbues the worshipper with a will to overcome obstacles along with the intent of surrender to the lord. Some more in praise of the marigold. It is known to have protective properties. Marigold does not have a pleasant odour , unlike most other flowers and yet is used for worship and decoration. Wondering why ? The flower is often strung into a sort of a garland called the torana , hung above the doors of traditional Indian homes and the unpleasant odour is said to keep insects at bay. The same goes for worship-time. It keeps insects away from the place of worship and the idol. Another instance from the past when I got rooted to the spot on beholding this Buddha in a terrace garden at another party. Another private moment of contemplation. India , Thailand and Cambodia have several Buddhist monasteries all over ; have visited most of them. My mind is now set to tour Leh Ladakh , Tibet and Nepal. The Buddha calling ! Insha’Allah !